Following on from my blog post outlining an A-Z of Digital, here is “Y for Yottabyte”. You are probably more used to terms such as Megabyte, GigaByte of Terabyte in every day computing terms. Yottabyte is a term used to define an amount of storage that is a lot bigger than these. The prefix yotta indicates multiplication by the eighth power of 1000 or 1024. With the growth of the internet, social media, mobiles, IoT, wearables and other data creating devices and systems we are each creating large amounts of data everyday which need to be stored somewhere (this can be at your home, work, cloud or a 3rd party collecting the data you create). So how much data do we create every minute? 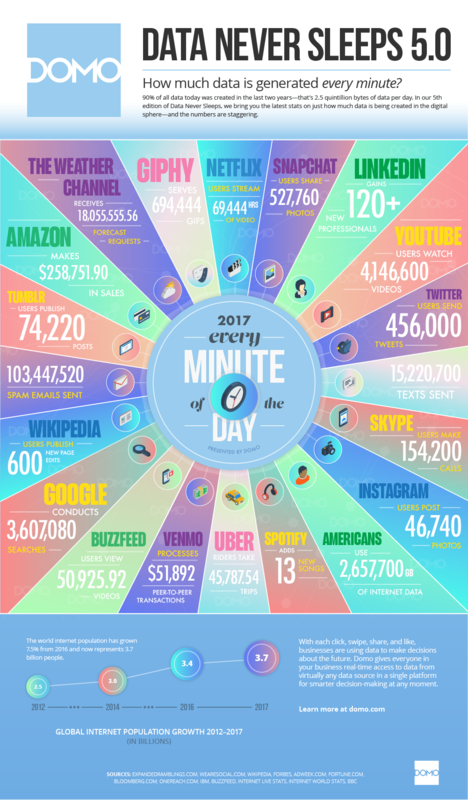 Domo have produced an infographic that illustrates how this is created across multiple platforms and systems, such as 456,000 tweets and 2,657,700 GB of internet data used by Americans every minute. The generation of data brings challenges of what to do with it and how to mine it for useful information through big data, AI, machine learning, data science and analytics This has brought two views as to whether data the new oil or not (Data is the new Oil vs Data is not the new Oil). How much data are you generating today!